‘It certainly does seem to have been a popular exhibition, there were over 300,000 visitors. This success must have prompted the promoters to find a new site in Rusholme, (between St James School & Old Hall Lane, now Manchester Grammar School playing fields) to build the Rusholme Exhibition Hall’. 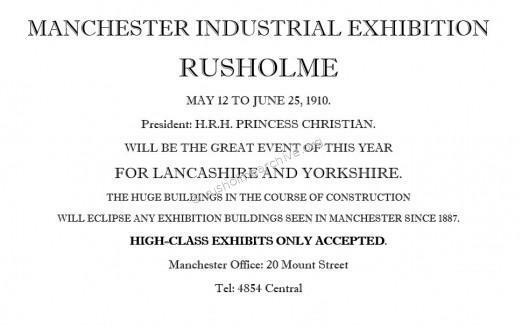 One of the difficulties in researching this piece of Rusholme history is that the ‘Rusholme Exhibition Hall’ had a comparatively short life of only 3 years. At no time between the opening of the Hall in 1910 and its destruction in 1913 were any maps or documents created from which I could clearly identify the site. One or two references in press articles gave me some indication of the site but a recently discovered photograph has confirmed the location. 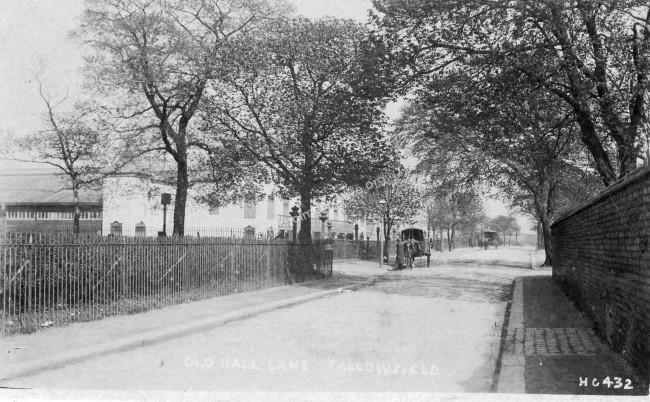 The photograph below is a view along Old Hall Lane, looking in an eastward direction and does show the exhibition building on the left of the frame. I have edited the same photograph below and this does show a clearer illustration of the Hall with what I presume is the main part of the exhibition area on the left of the frame. To give another view of the location I have shown an aerial view below with the site outlined in red. (The green line is Wilmslow Road.) This land is on the easterly side of the footpath between 'The Toastrack' and Manchester Grammar School playing fields. The following report was in the Manchester Guardian, March 22nd 1910. Exhibition of Industries. An elaborate Manchester scheme. ‘The building of wood and iron that is being put up in Old Hall Lane, Rusholme, for the Manchester Industrial Exhibition in May, promises to be the largest of its kind in the country. The main floor space, apart from the space for subsidiary offices is 100,000 square feet, an area greater than that of the Agricultural Hall in London. The promoters of the venture are the International Trade Exhibitions, who organised the successful electrical exhibition held in the same neighbourhood last year. The scope of this year’s exhibition is, of course, considerably larger. The term “industrial” is widely comprehensive, but it may be taken here, we understand, to have a more domestic significance, the exhibits, without being restricted in any way, will be amplest on the side of things for the home and for the making of homes. Thus, special sections will be given over to the building, furnishing, and similar trades. 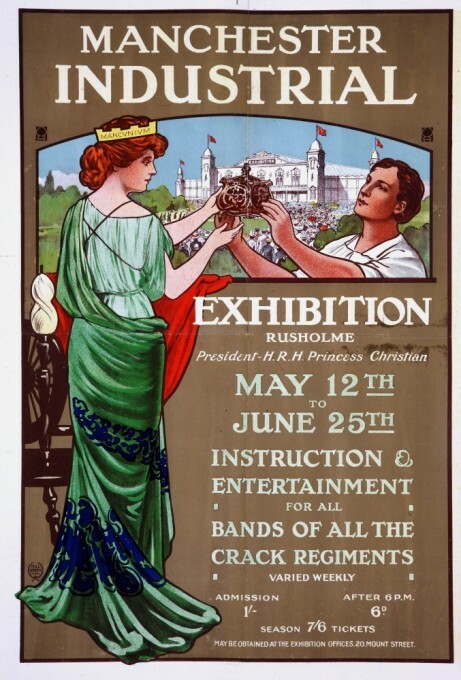 The opening advertisements for the Exhibition listed a wide range of events and displays with headings such as; ‘The Ladies Dress Section should be most attractive’, a number of ‘Crack’ bands would be playing, below I have copied the Guardian advert in three sections. The vibrantly coloured poster below is from the collection at the National Archives, Kew; They have generously given rusholmearchive.org permission to display the image. On May 10th 1910, two days before the opening of the Exhibition, King Edward died of a heart attack, a popular monarch his death cast a shadow over the entire nation. The Manchester Guardian published the following account on May 16th. INDUSTRIAL EXHIBITION OPENING IN MANCHESTER. 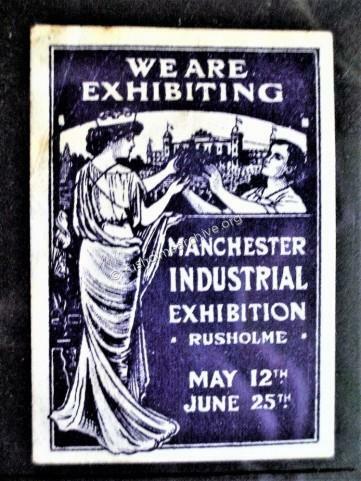 "The Manchester Industrial Exhibition was opened to the public on Saturday. In consequence of the national mourning there was no formal ceremony, but it is understood that the Lord Mayor (Mr Charles Behrens) will attend and declare it open at a date to be fixed after the funeral of the late King. 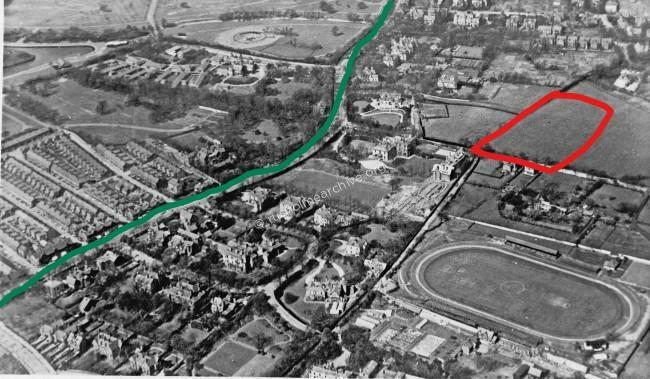 The exhibition buildings at Rusholme cover a large area of ground, and as they are intended to be used for similar enterprises after the close of the present exhibition on June 25 they are of a fairly substantial character. The promoters of the undertaking have decided to hand over 5 per cent of their gross receipts at the gates to Lancashire charitable Institutions. An its name implies, the exhibition is, in the main, devoted to the industrial arts, but there is a collection of paintings and engravings, and music is provided by well-known bands. There is also a loan exhibition of considerable interest. Included in this will be found the first all British aeroplane to fly, made and used by Mr A. V. Roe. 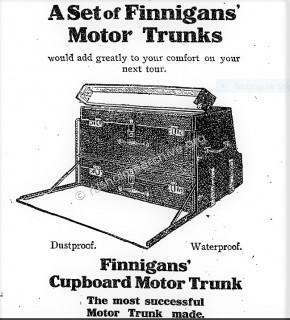 There are also models lent by the Lancashire and Yorkshire and Midland Railway Companies and others of engines, ships, yachts, motors, and other mechanical inventions. One section of the exhibition is called " Olde Manchester,” and is built to give an impression of what the business part of the city was like some hundreds of years ago. One of the links of the past which will attract attention is a portion of Old Garrett Hall. There are nearly fifty shops in this department of the exhibition, and the effect of the whole is exceedingly quaint. There is plenty of variety in the way of entertainment. For each Saturday the exhibition is open physical drill competition and gymnastic displays have been arranged under the direction of the Manchester and Salford Practical and Recreative Evening Classes Committee. The competitors will be drawn from various boys’ and girls’ institutes, clubs, and schools. Specimens' of some of the best work produced in nearly every trade, and handicraft is exhibited, and many processes of manufacture may be seen. Henshaw’s Blind Asylum, Old Trafford, in a section of the exhibition building, give practical demonstrations of Swedish weaving and tapestry, basket-making, machine knitting, coir mat making, and even shorthand and typewriting by blind persons. The Ancoats Hospital have arranged a model ward, with nurses and attendants, and demonstrations are given of X-ray investigation. At the stand of the Manchester and Salford Boys’ and Girls’ Refuges and Homes, Strangeways, printing, carpentry, shoemaking, and tailoring are seen in operation, and similar work carried on by the boys of SL Joseph’s Industrial Schools is also illustrated. I have found the following information about Thom's on the website Graces Guide. Thom, David, & Company, Limited, Whit Lane Works, Pendleton, Manchester. Telephone: Pendleton 2838. Telegrams: Thom, Manchester. Passenger station: Pendleton, 1 mile. Goods station: Brindle Heath, 1 mile. 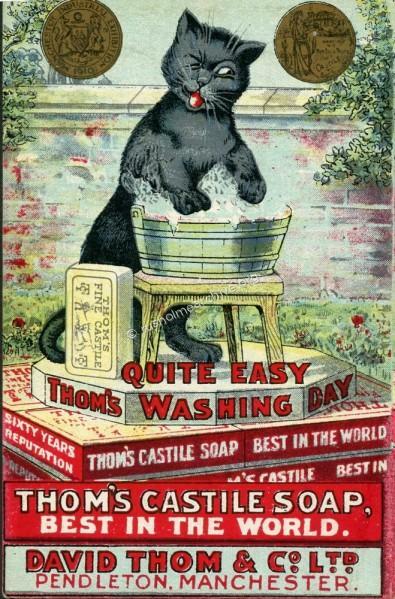 — Hard, soft and dry soaps for household and manufacturing use; carbolic and laundry soaps, soap flakes, toilet soap, Thom's castile and glycerine. 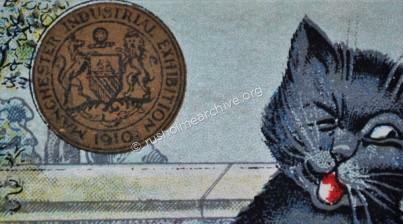 In the close-up illustration underneath you can see the circular emblem for the 1910 Exhibition. 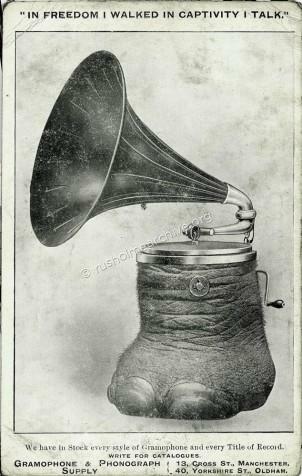 Another of the items that I have come across relating to the Exhibition is an advertising postcard for a Manchester business, The Gramophone and Phonograph Supply Company. Altogether it does seem a rather disagreeable piece of advertising and I cannot imagine that anyone would find it acceptable today, clearly, however this was not the view of Mr. Jones the proprietor. Located at 13 Cross Street, Manchester, the company were enthusiastic promoters of the *Auxetophone. I can only imagine that judging by the message on the back of the postcard the company must have been displaying the Auxetophone at the Exhibition. *The Auxetophone was the most successful and powerful mechanical device to amplify recorded sound. It was the product of combined efforts by Horace Short (of Short Brothers' aviation fame) and Sir Charles Algernon Parsons, inventor of the modern steam turbine engine. When playing gramophone records, this reproducer could be used in the open air, in a large hall, or even compete with an orchestra. The Auxetophone represented a radical shift in the function and reception of recorded sound and amplified music, making it possible for the first time in history to successfully play at significantly loud volume in public spaces. Despite endorsements by famous musicians, the Auxeto met with hostility and one critic suggested that the noise was so bad you would need a steam turbine engine to get away from the cacophony. Another rather small illustrative item that I have found is an adhesive postage stamp sized ‘flyer’ that might have been on postcards and certainly was stuck to various exhibits. As you can see the illustration is like the poster above. One report that I found when searching the internet does give a further idea of the size of the interior of the Exhibition Hall. The report below came from Flight Magazine, all issues back to 1905 have been digitalized and you can read the article below. Manchester Aero Club (Model Section), October 1st 1910. "The last flying meeting of the season was held in the Exhibition Hall, Rusholme, on Saturday last, and proved a great success. Altogether there were 30 competitors, and all the machines were of the monoplane type, proceedings being watched by a fair number of interested spectators. The first event was the final flights for the season’s aggregate competition, and the winner proved to be D. Wood with his Fleming-Williams machine, with A. R. Whitworth as the runner-up. The second item on the programme was a contest for models under 30 ins. span, and it was won by V. Wood, whose model flew 145 ft., while J. Whittaker was second with 138 ft. The large models completed in the third event, where the honours fell to K. Kinna, his model flying 200 ft., W. S. Williamson being second with 181 ft., and J. Whittaker third with 139 ft.
Two prizes were offered by Mr T. W. K. Clarke for the longest time in the air by a Clarke model, and they were won by K Kinna (17 secs.) and A. R. Whitworth (10 secs). In the circular flight event the prize fell to A. W. Whittaker, while in a youths’ competition for home-constructed models, the prizes were secured by A. B. Willcocks (183 ft.) and A. K. Whitworth (163 ft.). The closing item was a point-to-point race round the hall, and three competitors tied, each doing the course in six stages. In the run ofl the models were flown simultaneously, and the winner turned up in A. Whittaker. A good deal of interest was taken in a large petrol-driven model exhibited by Mr Brent". 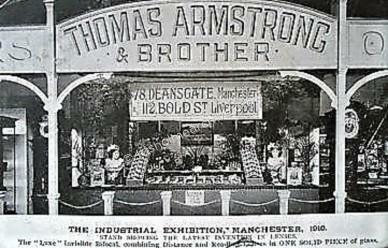 One well known Manchester company that had a stand at the exhibition was Thomas Armstrong and Brother. They were notably manufacturers of optical and other scientific instruments, the postcard below is of their stand and presumably used as a publicity ‘flyer’. 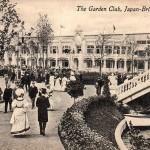 Later in the year the Anglo Japanese Exhibition was staged at the Rusholme Exhibition Hall. Opening of Japanese Exhibition by the Lord Mayor, Nov 28th 1910. "The rattle of the hammers had not ceased in the great Exhibition Hall at Rusholme on Saturday when the Lord Mayor of Manchester opened the Anglo-Japanese Exhibition. Workmen were still busy in various parts of the building, and there were many signs of incompleteness about the Exhibition. There was enough, however, to absorb the interest of visitors for many hours, and what was lacking will be forthcoming in a day or two. The Lord Mayor, in declaring the Exhibition open, said it was only right that he should elate the reason that led him to associate himself with what was avowedly a commercial undertaking. 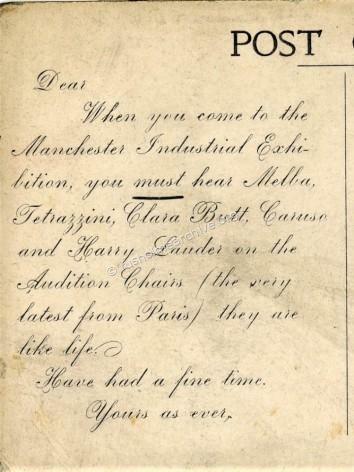 It was that the promoters had shown themselves commendably interested in the poor of Manchester, and so far solicitous on their behalf as to promise 5 per cent of the gate money, with, a minimum of £160, towards the funds of St. Mary’s Hospital, which to-day unfortunately and, in his opinion, to the shame of Manchester, although built and fully equipped, was not yet accessible to the many needy patients awaiting its opening. He had been looking forward to this exhibition. Things Japanese appealed to him very strongly and took his mind back to one of the pleasantest holidays he had ever had, the few months of 1907 which he and his family spent in Japan. He could not forget the charm and wonder of that visit, the charm of the old, the wonder of the new. The very charm of the life and character of the Japanese made one wonder at the virile strength which lay behind their gentle, truly poetical and artistic natures, and had enabled them in the short space of 40 years to learn all that our so-called Western, civilisation had to teach in the arts of peace and war. They had absorbed all that the West had to say on industrial science, commercial enterprise, and powerful armaments. He had been to Osaka, the Manchester of the East, with its teeming population larger, he believed, than that of Manchester, and he realized that there we had keen competitors, especially in the Lancashire trade. When the Japanese sent goods to China, as they certainly would do in a short time, it would take us all our time to compete successfully with them in that market. Anybody who visited the Anglo-Japanese Exhibition in London must have realised that we had much to learn from the Japanese. Councillor Thewlis also spoke a few words. He believed that in promoting this Exhibition and in making it succeed, Manchester would have done something to promote an understanding between England and Japan which would have far reaching effects. Mr J Ando, the president of the Japanese Section, made a short speech in his own language which was interpreted by Mr. A. F. Misluku, the manager of the section. Before the opening the Lord Mayor and a number of other guests were entertained to lunch in the Exhibition dining hall. There were present, besides those taking part in the opening ceremony, Miss Behrens, Sir William Bailley, Mr Ford Smith (Japanese Consul), the Dean of Manchester, Mr Alderman Carter, Mr J K Bythell, the Chief Constable (Mr.Peacock), Mr. A. M. Samuel, Mr. S. W. Royse, and Mr Walter Stenning (organising manager)." 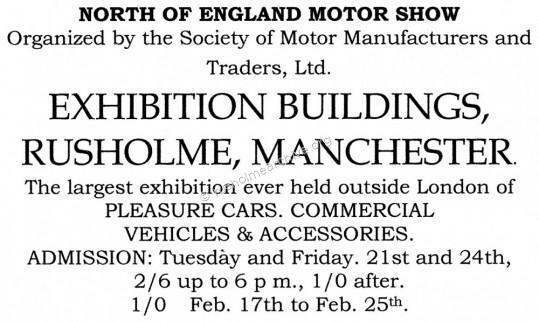 Although the Rusholme Exhibition Hall had a short life of just three years there was one event staged annually that always proved a success, the Northern Motor Show. 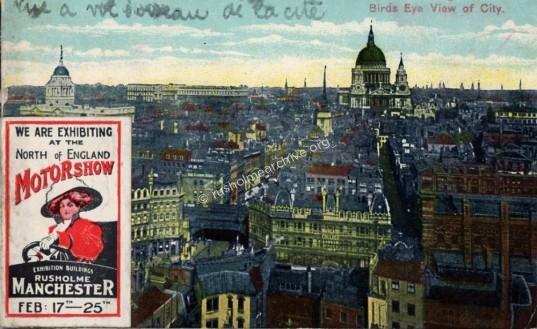 The postcard below is French and I can only imagine that the small flyer stuck in the corner was perhaps from one of the French Motor Car Exhibitors……?? I have set the final part of the speech in italics - Lord Derby was quite right in his anticipation of the growth of commercial motor vehicles! 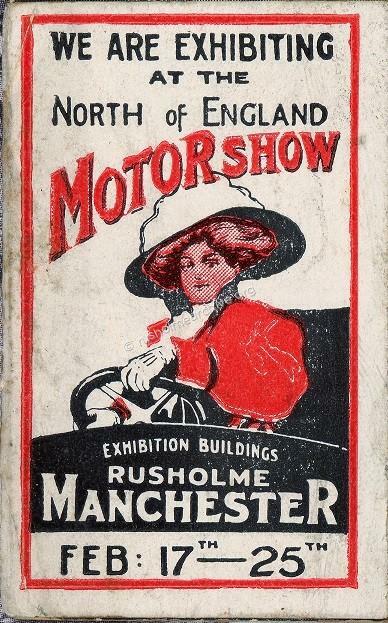 “The North of England Motor Show at the Exhibition Buildings, Rusholme, Manchester, is proving a popular attraction. Thera was a large number of visitors on Saturday. The show is evidently appreciated as a means of learning the newest and best features of motors both for pleasure and commercial purposes. It gives an opportunity that has previously been limited to London of comparing different makes and types, and it offers a wide range of choice to the intending purchaser”. During the 30+ months of the Exhibition Halls remaining life there were a variety of exhibitions, I have not endeavoured to trace all of them, but some have particularly caught my attention. It may be an exercise for the future to digitally research local newspapers and create a chronological list of all the different exhibitions. 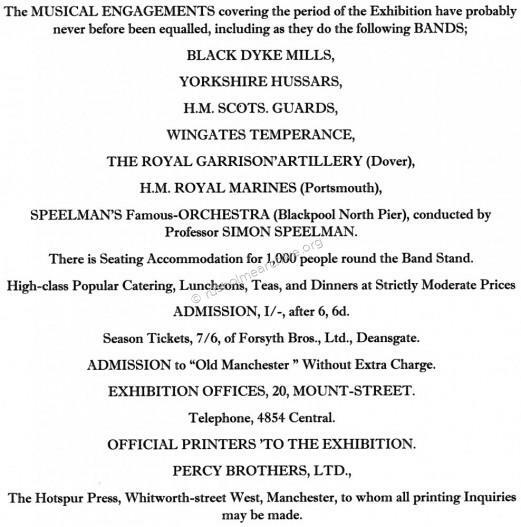 The one characteristic that I have noted about all the exhibitions is the absence of ‘canned music’ technology, live bands were always featured as an attraction. One exhibition that I noted was the Greek Currants and British Fisheries – a curious mix but they clearly were instructive and certainly played a role in cookery education. “The Greek Minister (M. Gennadius) visited Manchester again yesterday accompanied by Madame Gennadius, who, in the evening, presented the prizes gained by girl pupils associated with the Exhibition. Besides the Minister and Madame Gennadius, there were present the Greek Consul in Manchester (Mr. S. Hazzopulo), the Vice Consul (Mr. Petros A. Kestorides), Major and Mrs. Wood, Captain and Mrs. Harrison, Sir John Wrench Towse, of the Worshipful Company of Fishmongers, and Mr. Edward Bowron. Madame Gennadius handed the prizes and certificates to the successful pupils, and afterwards the Greek Minister expressed the pleasure which it had given him and his wife to come from London to Manchester. They were especially gratified to see that a large number of young people had merited the award of prizes. 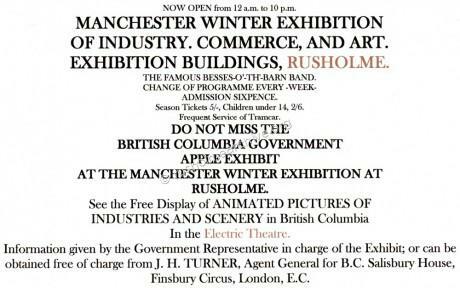 In December 1912 the British Columbian Government sponsored an exhibition entitled ‘Apples’, see below notice. In March 1912 the Manchester Guardian printed a report about the Building Trades Exhibition, this was not exactly an ‘Ideal Homes Exhibition’ but does offer a brief insight into how new homes were thought about. "The Building Trades Exhibition at Rusholme, which opens to-day, is here by invitation. 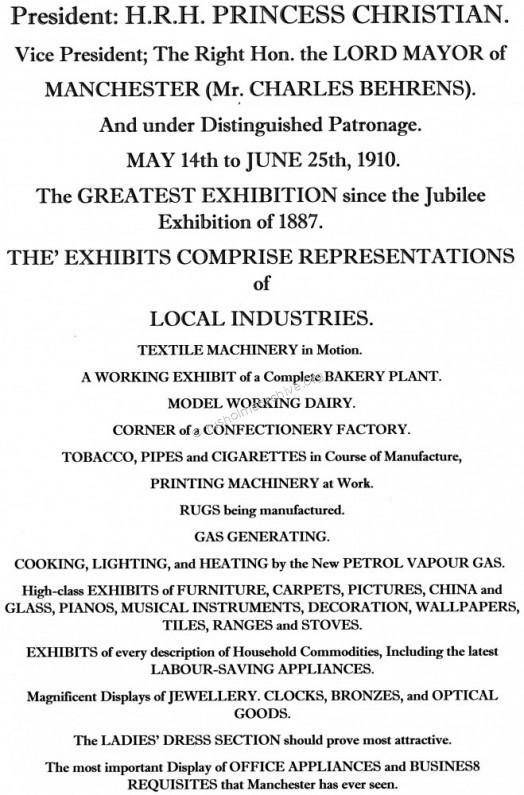 It is practically the same exhibition, on a very slightly reduced scale, as the London Building Trades Exhibition, held first, at the Royal Agricultural Hall from, the year 1895 to 1905, and after that at Olympia. The promoters have been constantly approached, during the last ten years in the hope of getting them to hold an exhibition of this sort on a large scale outside of London. Other cities were proposed, but Manchester offered the best accommodation for such a large undertaking in the Exhibition Hall at Rusholme. One recognises many of the stands which were at Olympia last year, and no doubt the list of exhibitors is very much the same. Although this exhibition will be a popular one, it is intended also to give points to the architect and the builder. Everybody who lives in a house will be interested in this collection of the latest domestic things. The constructional exhibits are more recondite, and things like cement mixers, tar sprinklers, and portable railways will appeal to those who build for a living. The exhibits at an exhibition of this sort require an elaborate setting. If someone has a good paint he has to build a room to show it off. There is indeed a charming “Adams” room built for the sole purpose of exhibiting a well-known distemper on the walls. Brickmakers build houses as though they really meant them. One firm has built unto itself a house that rears its chimney well out of sight amongst the rafters. It is built of delightful hand-made bricks, and it is a very attractive thing to look upon. One of the most attractive stands is that of a firm of paint manufacturers. The stand is the foredeck of a battleship. There is the funnel and the navigating bridge and two big guns all painted an unfamiliar white instead of the usual battleship-grey. One of the eights of the exhibition is an old English garden, delightfully laid out and occupying a very considerable proportion of the available floor space. Passing under a pergola one enters extensive grounds of green felt grass with cocoanut matting paths. They contain an old English shingle-roofed summerhouse and also a Japanese summerhouse, but the English one, in stout oak with elm weather boarding and windows of glass, would seem to be the best for England. The wooden seats and tables in this old English garden are models of simplicity and elegance and their white paint goes well with, the green fen. The garden contains a good many vases and well-heads of marble and terra-cotta and one or two fine copies of old Italian marble seats. For the most part these ornaments come from Italy and are copies of old work. Although our terra-cotta has improved enormously in recent years, the English clay will not give a finished surface like the clay which comes from Italy. Many firms exhibit terra-cotta in all colours, shades, and shapes. One firm shows an ingenious device for building up terra-cotta facing tiles with a reinforced concrete wall. The whole fabric is built up together, as the difficulty with terra-cotta is that it warps and twists. This method seems to be superior to the old hollow block method. In a smoky city like Manchester Teracotta has immense advantages, for it can be easily washed. There are many exhibitions of various methods of reinforcing concrete, but they do not vary a great deal. But it is clear that ferro-concrete is being used more and more. Whereas at one time it was only used for very large work, it is now used for practically all kinds of buildings, large and small. The usual method of building up walls in ferro concrete is, of course, to build wood sides to the wall and pour in cement, the tension bars and wires being previously in position. One exhibitor here has a different method. He built a detached villa some time ago by moulding the walls, including a classic cornice, flat on the ground with their lower edges in position. They were then hoisted and bolted at the angles and finished off with a coat of cement. In this way a house can be built much more quickly than by most other methods of ferro- concreting and, of course, ten times more quickly than in brick. 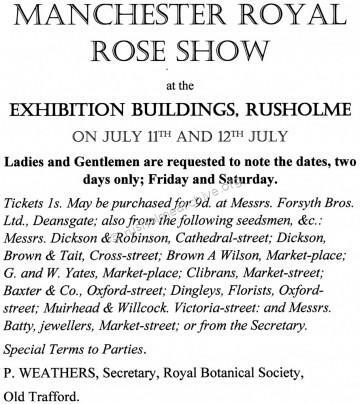 In July 1913 there was a ‘Feast of Roses’ when the Royal Botanical and Horticultural Society of Manchester held their first show in Rusholme instead of the Botanical Gardens at Trafford, (now known as the ‘White City’). “In addition to the other attractions, concerts are given at frequent intervals by the Queens Own Yorkshire Dragoons under the direction of Lieutenant Suckley”. 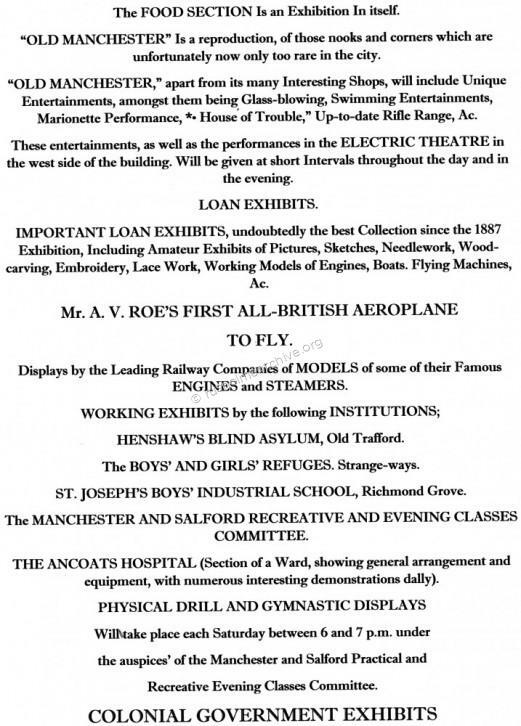 Later in 1913 towards Christmas, (when plans were well in hand for the 4th Northern Motor Show during January 1914), Asquith, the Prime Minister, (married some 36 years earlier in Rusholme) was planning a visit to Manchester. However, just before his visit, suffragettes set fire to the Hall on the night of Saturday 6th December. Being built largely of wood it was completely burnt to the ground. National newspapers reported the arson attack and more locally the Manchester Courier drew attention to the fierce conflagration putting at risk the church of St James, Birch-in-Rusholme which was barely two hundred yards away. 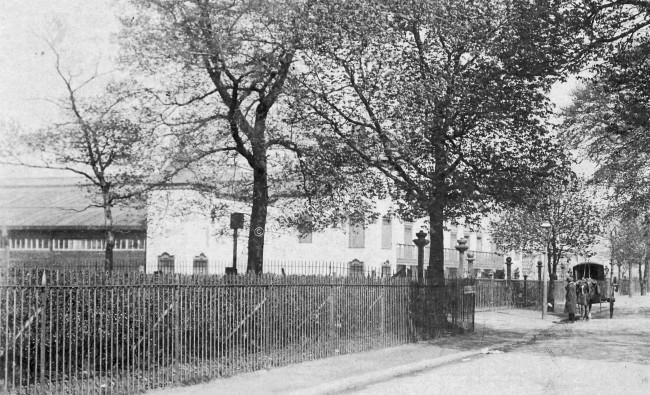 I am very grateful to the Museum of the City of London who have given rusholmearchive.org permission to use the photograph below – I have also reproduced the text that accompanies the image – succinct, it refers to the circumstances in which a significant, but brief part of Rusholme history was so rapidly destroyed. 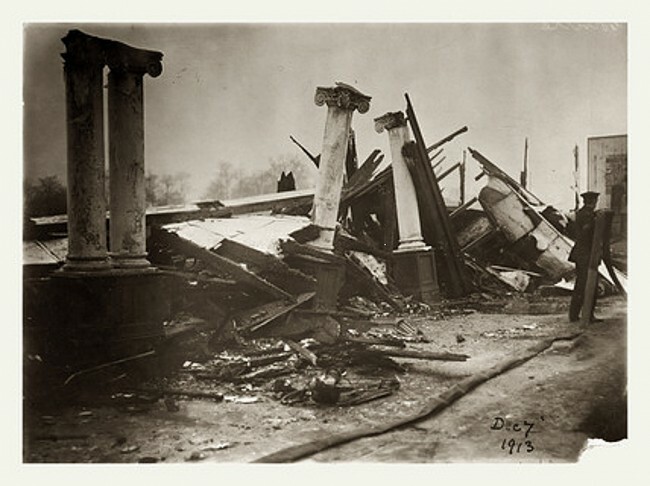 “The photograph shows The Rusholme Exhibition Hall in Manchester after it was destroyed by fire on December 7th, 1913. The building was unoccupied at the time of the fire, which is believed to have been set by suffragettes. This attack was one of several arson incidents in the area carried out by Suffragettes and timed to coincide with Prime Minister Asquith's visit to Manchester and Oldham. The campaign was in protest against the arrest of Emmeline Pankhurst and although the suffragettes did not admit responsibility, nearby was found an imprint of a woman's boot; suffrage literature and a note addressed to Asquith saying, 'This is your welcome to Manchester & Oldham'.